Wishing for more leads for your business? If Yes! Say Hello to Local Lead Generation Studio. Now no more relying on Adwords or spending hugely on advertising for meager clicks. Take things into your hands! Collect your own hyper-targeted leads with Local Lead Studio. Achieve your 100% authentic business leads for $69 only! Recover the cost in the very first month of its usage. Buy Now! What Exactly Is Local Lead Generation Studio? Local Lead Generation Studio is the best tool you can use for generating 100% authentic local leads which will convert well for your business. It is a chrome extension which does all the hard work for you. It scrapes Google maps for its exhaustive quantity of data on local businesses. This gives you high-quality usable business data. You can then export the data at the click of a button in the form a convenient excel file which enables you to easily format and filter it according to your requirements. Local Lead Generation Studio is easy and effective to use. All you need to do is install a simple chrome extension and you are all set to locate and reach out to 1000’s of potential business leads. No technical knowledge is required. You can handle it yourself or employ a VA to do it for you. The tool is functional in all 100 countries that Google has a presence in. Local Lead Generation Studio enables you to find local leads for your business at a streamlined and astonishing pace. This saves you time as you won't have to focus on less effective, resource wasteful techniques to find leads from a huge quantity of confusing data. Local Lead Generation Studio lets you have total control over the process of lead generation. You can customize the search parameters as much as it suits your needs. The tool gives you complete freedom to select keywords and the area they are meant for targeting. You can mix and match and have a trial and error process until you discover the right audience that will meet your requirements. Getting data about local businesses you can target has never been easier. Google has the world's largest database among all search engines and directories. It gathers the required data from innumerable sources and directories including but not limited to Yahoo and Yelp. Local Lead Generation Studio scrapes all important contact data such as phone numbers, addresses and even websites from Google maps. This data is 100% genuine and can be used by you to reach out to the local businesses of your choice. What Local Lead Generation Studio Can Do For You? Targeted real local leads are just a few clicks away from you with Local Lead Generator Studio. Just install the chrome extension, and you are ready to roll. Why Buy Local Lead Generation Studio? Scraping Google maps will give you excellent leads of local businesses. Local businesses, however, have more modest budgets and are willing to avail services from modestly sized companies as they are not familiar with the digital space and the opportunities it presents. These businesses get converted easily and are less of a hassle to manage. You simply have to install the Google Chrome extension and you will be able to find and contact 1000's of leads which can help your business grow. What's more, you don't need any technical knowledge to use the extension, either you or a virtual assistant you hire can handle the job easily. Local Lead Generation Studio is a chrome extension, this means that you don't need to download or store any dial space hogging bulky software on your PC! Use the product anytime, anywhere. Local Lead Generation Studio needs manual intervention to work. Because automation is limited, it means the implementation is simpler and you also save on proxies and VPN which would otherwise be needed to find data from Google on thousands of leads. 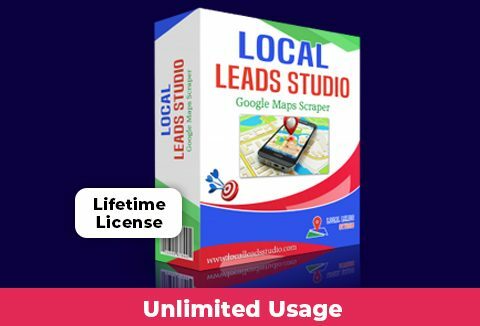 You need no other accessory software to get started with Local Lead Generation Studio. All the data scraped is downloaded and compiled in a simple, easy to understand Excel sheet. You can easily filter this based on the multiple data fields. If you intend to sell the data, then such an excel sheet is one of the best ways to package the data in. Is Local Lead Generation Studio For You? New to the market and want to make some quick and easy money online by marketing and selling scraped business data. How Can You Make Money With It? The filtering feature allows you to find out businesses with a low number of reviews or low ratings. So you can target them personally to pitch your service. You can make them understand how you can make a difference for them and give them an edge over their competitors. Businesses with incomplete data, no images or timings mentioned are probably unclaimed listings. You can pitch these businesses the advantage of claiming their listing on Google. Local Lead Generator Studio can help you filter out unclaimed businesses which you can contact in person or by email. It shows that the person owning the business is either not active or aware of the opportunities in the digital world. Thus you will definitely get the client if you push the right buttons. Grab your copy of Local Lead Generation Studio and take your business to new heights today! This deal comes with a Lifetime License. No more manually searching for leads. Get your copy of local leads now! At A Price Of $69 Only! Very useful to find leads with this plug-in. It helps me to find customer. The export file could be improved, the excel file is a little messy at the export. If we can export in PDF, too, it will be great. Very Nice software. Exact what we want. Can be more useful if it can extract emails as well which might be added in future. But still a great software in itself I say.